When I was 20 years old, I bought my first new car – a 2002 Mitsubishi Gallant. I have to admit, the creamy pearl paint job and leather seats lured me in. Once a salesman started convincing me that I could afford it, I realized that I had to have it. I had just gotten my real estate license but was undeniably unemployed. “Well, you should be able to make at least $30K a year selling real estate, right?” the salesman assured me. Well, sure! If a salesperson makes that statement, then it should be true, right? I certainly fell for it. At the time, the current dealership promotion was “No Payments For a Year.” That sounded great to me since I wasn’t actually making money. In theory, I should’ve been able to get my real estate career up and running within a year, right? Then I could start making payments immediately. Now, don’t get me wrong: I’m definitely money motivated. You don’t turn a side hustle into a $200K per year gig without chasing the cheddar. But selling? Yeah, it’s not my strong suit. To top it off, real estate sales is very competitive in my area. Realtors are everywhere, and I didn’t like competing with them. Plus, I enjoy helping people more than I enjoy trying to get them to buy something. Ugh… this car cost me dearly. My first “real” adult job was at a group home for the mentally handicapped. The job was fine, but I made a miserable $9 per hour. By this time, my car was no longer shiny and new. Worse, the $550 monthly payment was due for the first time. What was I going to do? I brought home less than $300 per week, and the payment on this monster was nearly half of my take home pay! 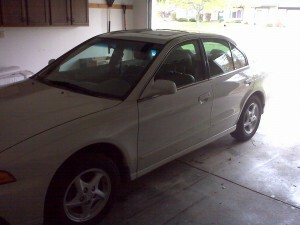 Add in the cost of gas, insurance, and maintenance, and this car was costing me well over half of what I earned. It was then that I began to realize what a huge mistake I had made. Luckily, I was living at home at the time. Having that safety net, a backstop that many don’t have, really saved me. With the bill now due, I started paying as much as possible. Some months, I would pay my entire income on that stupid car. Other months, I could barely come up with the minimum payment. Fortunately, things changed quickly for me a few years later when I got a higher paying job. I was able to pay between $1000 and $1500 per month. I made the last payment in early 2006, just a few short months after marrying my husband. My Mitsubishi Gallant was a big mistake and a total waste of money, but it taught me some incredible lessons. First, I learned not to buy things that I couldn’t afford. Spending half one’s income on transportation is just plain silly… and irresponsible… and dumb. I should have bought an older used car or kept the perfectly good car that I already had. I also learned that taking on debt is self-imposed enslavement. I had to plan my life around that car. It stifled my creativity, robbed me of flexibility, and controlled my financial future. After all, how could I save money for my future while having such an enormous expense? I couldn’t. Additionally, I learned that looking like you have money and actually having money were two totally different things. Sure, my car was shiny and new, but I lived at home with my parents into my mid-twenties because of it. I didn’t have any money to speak of, and every extra penny I made was paid toward my debt on that car. Unfortunately, looking fancy came at the cost of being broke. I sold that car in 2008, and I got about $2,500 for it. My prized Mitsubishi Gallant – the car I paid for with pure determination, sweat, and tears – sold for less than 10% of what I bought it for. Depressingly, I finally realized the true cost of that automobile. All the time that I worked to pay it off meant absolutely nothing. If I had kept the car I previously had, I could have saved tons of money, worked less, and probably changed my life in numerous ways. Had I not bought that car, my financial life could have turned out completely different. But, I may not have learned all of these lessons either. Sometimes, learning the hard way is truly a gift. Get on a Budget – A budget is your most powerful tool for avoiding and correcting financial mistakes. It tells your money what to do and where to go, helping you make the most of what you already have. My favorite type of budget is a zero-sum budget, but any style is better than none. Track Your Spending – Tracking your expenses is a great way to find holes in your budget and keep you moving toward your goals. It forces you to be accurate, and keeps you from using estimations and guesses that could cause you to overspend. Create an Emergency Fund – Emergency funds are essential so that you don’t fall behind due to surprise expenses. When something pops up, just dip into your eFund to take care of it. Start by saving $1,000. Then, build your emergency fund large enough to cover 3 to 6 months’ worth of expenses. Learn to Say “No” – When it comes to my car, the biggest problem I had was telling myself “no.” I wanted that car, and I wanted it now. Unfortunately, I couldn’t afford it. Learn to live within your means, avoid using credit, and start telling yourself “no.” Your wallet will thank you. Learn from Your Mistake – Most of all, learn from your mistake and avoid doing the same thing in the future. Use this as motivation to get out of debt, then stay out of it forever! In our new book, Zero Down Your Debt (in stores January 10th, 2016), we show you the exact steps to do this by using a zero-sum budget, tracking your spending, and more. Now that it is all over, I’m actually glad I bought that car. I think that the lessons I learned were worth the money spent. Now, 12 years later, I would never put myself in that position. I drive an older model minivan that’s perfectly fine for putting around town. My husband also drives a used car, and we’ve learned to stop spending on things that we can’t afford. Most importantly, as I have become older and wiser, I have realized that I would rather have money than just look like I do. We all make financial mistakes. How you react after you’ve made them makes all the difference. Will you keep digging yourself a bigger hole, or will you recognize the error of your ways? Your financial mistakes don’t have to define your future. There is hope. Apply what you’ve learned, and vow to move forward with a new attitude toward money, debt, and life. You can do it… and I’ll be here to cheer you on! 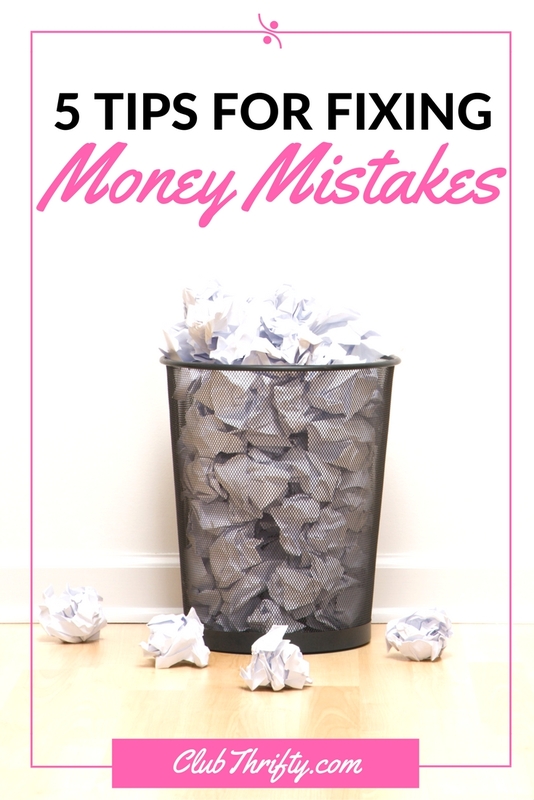 What money mistakes have you made? What did you do to recover? Let us know in the comments! Toys ‘R Us Corporate Policy: Stealing?!? I love this list! I encourage my readers to do all of these things. Personally, having an emergency fund and being able to say no are the best tips for me. Tracking our spending had the biggest impact on our finances. There’s something about having it all laid out (in a nice Excel spreadsheet of course!) that helps you really understand where your money is going. Oh yeah, been there! I think when you’re younger (or maybe this is just me) you are only about the now and things requiring lots of money (i.e. retirement) seem so far off, so you might as well enjoy yourself now. I only wish I had “recovered” sooner. This is so timely! I wrote about my biggest financial mistake today. Learning is so important. And I don’t think we are ever truly done. At least, I’m not! I have a long, long way to go. For me, making one smart money decision doesn’t mean I have it all figured out. Remembering that is vital. It’s huge to take those mistakes and apply the lessons! We used to buy/trade/finance new(er) cars every few years and had a perpetual car payment. It took a few years, but we decided enough was enough. We stopped doing that, paid off the loans and don’t plan to finance another vehicle again. And not having the car payment(s) has allowed us to travel more and save more for retirement. I’ve made more than my share of financial mistakes. Our last big one was buying our first house about 11 years ago with no down payment. I feel like an idiot for making that mistake but I’m immensely thankful for the lessons that came out of that stupid decision. We’ve used and still use many of these tips to stay on track, thankfully it becomes second nature after a while. It’s definitely a case of when you know better, you do better. If we are always hungry for new knowledge, we will keeping growing and our bank accounts will too! Thanks for the story, Holly. I love the outlook. Sometimes our dumbest mistakes are the ones that teach us the lessons we need to move on. There’s no mistake that is entirely bad as long as we learn from it and improve ourselves going forward. Wooo girl, $500? A month?! Thr thought of a car payment that high sends me into a panic! This was a good learning experience and Im glad you are sharing it with others. Everyone makes mistakes, it is human nature! But how you overcome than and learn from them shows who you really are! We are glad to hear that you have learned a valuable lesson from your mistake! Thank you for sharing your list on how to recover from your financial mistakes with us! If you don’t mind us sharing, we have an article about how to buy a car that directly correlates with your article! We would love for you to check it out and share your thoughts with us! I really enjoyed reading this, I can imagine the epiphanies you experienced throughout the years of owning this car, and even in the years since! Sadly I see quite a few people around me having financial “lessons” presented constantly, and never learning from them. Isn’t it a sign of madness or something, to do the same thing and expect different results? I’m pretty sure all the Joneses are doing exactly that! I winced when I saw how much the car sold for. Automobiles depreciate so much! The biggest lessons I’ve learned for moving past money mistakes is getting into the habit of continually contributing to your emergency fund (my freedom fund as I like to call it) & general savings and also learning to say no to things that, when you really truly think about it, you don’t want (i.e. a shiny new car, big house, etc). I´m 34 and had never a new car. Here in Germany cars loose 30-40% of the value in the first year. I’ve been incredibly fortunate not to make any really expensive mistakes. With that said, I’ve spent way too much spending money out of peer pressure with friends. I had a fear of missing out but looking back I can’t even remember all the garbage that I bought. It’s the nickel and dime purchases that I made that really added up that I wish I didn’t spend. Anyway…thanks for sharing!!! Loved this! I think our biggest money mistake was not shopping around for cheaper schools and or not taking the time to apply for scholarships. I went to law school and hubby went to dental school and we graduated from both with a whopping $600k in student loan debt. And you are absolutely right– it feels like we enslaved ourselves!